What is a Dream Home? A Dream Home is a gorgeous, Orlando-area vacation home, with a private pool, right beside Disney World, that you can rent just like a hotel. 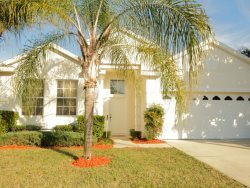 Our homes are minutes from Disney. We have the closest vacation rental homes to Disney World - you can't get any closer! No! Unlike timeshare, there are no contracts or annual fees – you just rent the home for one low nightly rate, for the dates you are coming down. Our homes have just about everything – including bedding, bath towels, pots and pans, washer and dryer, and more. We recommend bringing consumables such as soap, dish soap, paper towels, toilet paper, etc. We do provide a small starter kit with some of these things, however, vacation homes are a bit more self catering than hotels – and the starter kit might not be enough for your whole stay. We also recommend bringing beach towels for the pool, because we only provide bath towels. It’s also a good idea to bring sunscreen, and a roll of quarters for tolls. Do you sell discounted tickets to Disney, Universal, and other attractions? Yes! We are authorized ticket vendors and you can order your tickets at check out. Or give us a call at 407.396.2233. Public transportation options are limited in this area, so we recommend renting a car, if you aren't bringing a car of your own!